Riverside apartments with the best views of the Tyne. Smokehouses bring 80 apartments to the waterfront at Smith's Dock. Urban Splash and Places for People will also reveal the architect's masterplan vision for Smith's Dock, which will see a new world class neighbourhood of riverside homes, restaurants, cafés, shops and public spaces with stunning views and access to the water. From growing your family to downsizing, Smith's Dock offers a range of flexible homes to suit everyone's needs. 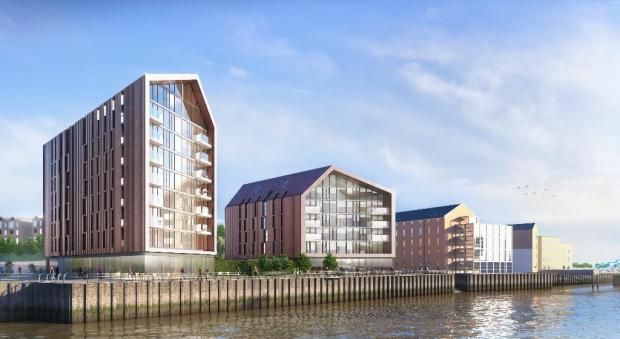 Smokehouses will stand tall at the river's edge; a brand new landmark inspired by the traditional smokehouses that used to line the nearby quays. Clad in natural zinc, the warm, robust texture of thebuilding's exterior reflects the daylight and enhances the building's form. SimpsonHaugh are lead architects for Smokehouses & the Smith's Dock masterplan. This Manchester-based architecture practice has an impressive portfolio ranging from master plans to interiors. SimpsonHaugh applies a creative and bespoke approach to every opportunity. Collaborating with clients, local communities and design teams, they harness their passion, knowledge and expertise to devise powerful and pragmatic solutions. "Smith's Dock is not only an important professional project, but also an important personal one to me. I'm from North Shields, I went to school in North Shields, I was brought up in North Shields. My family history is linked to this place and to Smith's Dock. My mam still works in a local primary school, and my grandad was a foreman in the local yards. Like many people from the North East, I was raised on family tales and stories from the rich history of ship building on the Tyne. If you're looking to create a sense of place, you have to look at what already exists, that's what makes this project special. It's a really proud legacy I have and why Smokehouses is of particular pride to me. I'm immensely excited about this next chapter." This historic Tyneside shipyard is being brought back to life as a brand new riverside neighbourhood. Smith's Dock is centred around three dock basins, where you'll find contemporary family homes, thoughtfully designed public spaces and plenty of places to eat, drink and play. The design principles behind Smith's Dock have helped us to create the kind of place where people love to live, and to call home. A proper community, with a range of homes designed to suit every person, family and lifestyle. From growing your family to downsizing, Smith's Dock offers a range of flexible homes to suit everyone's needs. Elevated above the former dockyard, this iconic new crescent of modern Town Houses is the definition of panoramic. These tall, roomy houses want to see and be seen, with big windows and even bigger views. With less limelight, but plenty of sunlight, a row of Fab Houses will occupy a more secluded spot. These are designed in collaboration with George Clarke, and are exclusive to Smith's Dock. Smith's Dock is a short walk from North Shields town centre, and close to the Metro which takes you straight into Newcastle city centre. It's easy to catch a ferry across the Tyne too. North Shields … What's on my doorstep? This beautiful beach is a great spot for surfing, playing host to numerous national championships. With its 2,000-year-old history and stunning sea views, this English Heritage site is the perfect day out. Explore the ruins, enjoy some fish and chips, or - on a sunny day - indulge in a spot of sunbathing. This giant monument is a memorial to Lord Collingwood, Nelson's second-in-command at Trafalgar. Housed in the recently renovated Victorian Tynemouth Station, visitors come from far and wide to peruse the market's 150 stalls. With its woodland paths, gardens, lake and bowling green, Northumberland Park is the perfect spot to enjoy a sunny day. The Old Low Light sits on the spot where North Shields began many centuries ago. A new Heritage Centre aiming to reveal the North Shields story in a new light. Pop down to the café and treat yourself to some homemade baked delights. This working quay dates back to the 13th Century. Today it's a great place for some al-fresco food - you can get everything from traditional fish and chips to fine dining. Together, Urban Splash and Places for People are creating a new coastal community that's built to last. Three-quarters of our children spend less time outside than prison inmates. We want to change that. That's why we're creating a safe haven for adventure, whether that's playing on the doorstep or in the shared private gardens. In fact, we think everyone should have the chance to play outside. Whether you're 6 or 60, you should be able to get out and enjoy life. Communities matter. They're built on strong design that creates privacy and neighbourliness in equal measure - spaces that are ours and spaces we share with others. And communities aren't just about people - we also want to feel proud of where we live. We want buildings with character, green space, a great local bakery and moonlit views of ships passing in the night. We think living well should be easy, with plenty of outdoor space and plenty of reasons to use it. That means fewer car rides to the gym and more walks on the beach. It means activities on your doorstep that make the most of the sea air, the shared gardens, the dockside and the coastal links. Good neighbourhood design should help you make your life simpler, creating opportunities to do more of what you like and less of what you don't. We can all agree there's no downside to sustainable living. From low-carbon houses to fewer cars on the road, it all adds up to using less and saving more, whether that's your bank balance or the planet. We also think greenery is good, which is why we're thinking beyond green space to green streets, vertical gardens and planted roofs. 'Home' isn't one-size-fits-all. Whether you are a big family, a home-worker, a first-timer or a downsizer, a mix of housing types means a choice of how to live. Which all makes for a stronger community. We also want flexible homes that can adapt to our needs, so we can stay longer in our neighbourhood. By thinking ahead, good design can offer what you need now and adaptability for the future. The former dock basin will be encircled by new Dock Houses, inspired by tall jostling houses of pre-industrial ports. These terraces take their inspiration from Tynemouth's Georgian and Victorian townhouses and the colourful terraces of British seaside towns. The river's edge will be lined with Smokehouses - waterfront apartments inspired by the simple smokehouses of Fish Quay. Modern fully fitted kitchens with range of wall and base units. Integrated under cabinet fridge with ice box. Thermostatic shower over bath to main bathroom. Walk in showers to ensuites. Oak laminate flooring to hall, living room and kitchen. Exposed concrete ceilings except kitchens which are plaster white finish, some bedrooms have plaster ceilings with white finish. Heat interface unit for hot water. BT and Virgin connection point to living room. Utility cupboard with space for washing machine. Property descriptions and related information displayed on this page, with the exclusion of Running Costs data, are marketing materials provided by Urban Splash, and do not constitute property particulars. Please contact Urban Splash for full details and further information. The Running Costs data displayed on this page are provided by PrimeLocation to give an indication of potential running costs based on various data sources. PrimeLocation does not warrant or accept any responsibility for the accuracy or completeness of the property descriptions, related information or Running Costs data provided here.